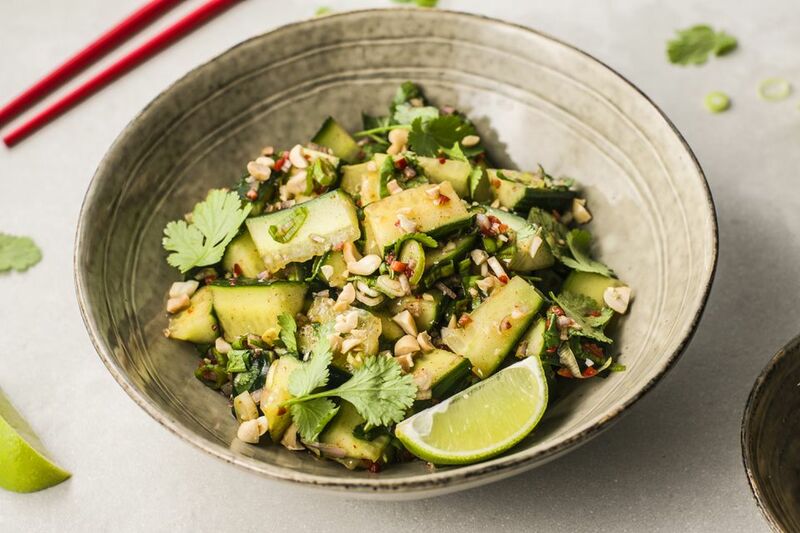 This Thai cucumber salad recipe is easy to make and brimming with the quintessential tastes of Thai cooking. It's one of my personal all-time favorite salads across any and all cuisines, and it takes only 10 minutes to prepare. Serve this unique and healthy salad as a side dish at dinner, or as a light and tasty lunch or snack. Also, a great salad recipe for a party, BBQ, picnic, or potluck party, since it can be made as you're going out the door! Cut cucumber in half lengthwise, then repeat with each half until you have a number of long strips. Now slice the other way to create bite-size rectangular chunks. Place in a salad bowl. Add the shallot, green onion, chili/red pepper, and cilantro to the salad bowl (keep back a little extra cilantro for a garnish). To serve, top with chopped peanuts, plus extra coriander. If desired, garnish with a slice of lime. Serve immediately, or cover and refrigerate up to 3 hours. For a vegetarian/vegan version of this recipe, use our vegetarian Thai cucumber salad recipe (Vegan), instead. If serving this salad as the main course, add 1 cup cooked baby shrimp as a protein source. Note that the longer this salad sits, the more liquid will gather at the bottom of the bowl or plate (juice from the cucumber). If you want to make it ahead of time, just be sure to re-toss the salad before serving. This salad is best eaten the same day you make it. Thai Salad with Cashews and Lots of Crunch!